North Korea's Brinksmanship: Same As Before, More Dangerous Or Both? : The Two-Way The North's move to block South Korean workers from getting to a jointly run factory park is a familiar way for the communist state to show its displeasure. But it comes at a time when tensions are as high as they've been in years. And the North's new leader is inexperienced at this diplomatic game. North Korea's Brinksmanship: Same As Before, More Dangerous Or Both? 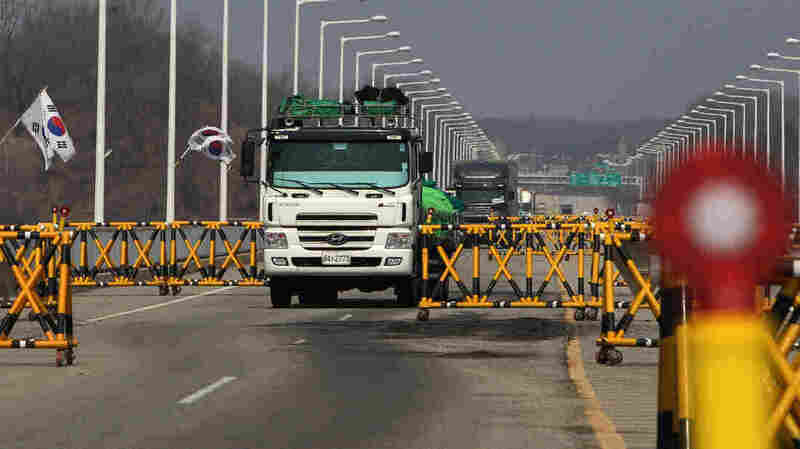 Turned back: South Korean trucks returned Wednesday after being barred from entering a joint industrial complex just across the border inside North Korea. "North Korea ... barred South Korean workers from entering a jointly run factory park just over the heavily armed border in the North, officials in Seoul said." On Morning Edition, NPR's Louisa Lim told host Steve Inskeep that this has happened before. In 2009, she said, North Korea cut off access to the industrial area three times to protest joint U.S.-South Korean military exercises that were then underway. So it's very possible this "could be a short-term move, not an irreversible step," Louisa added. But Louisa also said that while North Korea's regime is skilled at "this sort of cycle of threats" — particularly at times, such as now, when the U.S. and South Korea are holding joint military exercises — "the context [this time] is slightly different." The closing of the border to the factory workers, for instance, "comes against the backdrop of other North Korean moves" — including a recent nuclear test and the launching of a long range rocket. The North has also cut a hotline to the South, warned of a "simmering nuclear war" on the peninsula and has threatened the U.S.
Also different this time: Kim Jong Un, North Korea's leader, is "young, relatively new ... and inexperienced at brinksmanship," Louisa said. So there is a case to be made that while North Korea's rhetoric and some of its actions are familiar, the chances of a misstep are higher. As The Associated Press says of North Korea's move to keep South Korean workers from getting to the jointly run factory, "it's [just] the latest sign of deepening tensions on the Korean Peninsula." Hopefully, AP adds, "the rising tide of threats in recent weeks" won't be followed up with action, but are "efforts by the North to force new policies in Seoul, diplomatic talks with Washington and to increase domestic loyalty to young North Korean leader Kim Jong Un by portraying him as a powerful military commander." The industrial park inside North Korea where the joint work has been done is about six miles inside the communist state. About 800 South Koreans were already there when the North moved to block others from entering. Those inside will be allowed to leave — though Louisa tells our Newscast Desk that only 36 had chosen to do so as of early Wednesday (ET). Among our previous posts about North Korea and its rhetoric: Scott Neuman's look at: "How Credible Are North Korea's Threats?"